Rebecca Gratz helped establish several major charities for women, children and Jews in Philadelphia. According to legend, Washington Irving so vividly described Gratz to Sir Walter Scott that he was inspired to use her as the model for the Jewish maiden Rebecca in his novel Ivanhoe (1819), who chose to remain a spinster rather than marry a man of another faith. This portrait was painted in 1831 when Rebecca was 50, and was passed down through the family of Sara Gratz Moses, the daughter of Rebecca’s sister Rachel who died in childbirth when Sara was ﬁve. 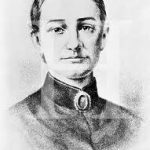 Rebecca Gratz was born in Philadelphia, Pennsylvania, on March 4, 1781, a middle child among twelve children born to Michael and Miriam Simon Gratz, and grew up in the elite society of Philadelphia. Orphaned at an early age, Michael Gratz had immigrated to America from Germany and made his fortune as a merchant. The Gratzes were active members of Philadelphia’s first synagogue, Mikveh Israel. Rebecca was well-educated at women’s academies and studied books about literature, history and science in her father’s extensive library. Many of Gratz’s closest friends were not Jewish, including Maria Fenno, daughter of publisher John Fenno. When the yellow fever epidemic of 1798 killed Maria’s parents, Gratz was deeply affected by the plight of the many orphans left behind. In her late teens, Gratz took her place among the social and literary elite of Philadelphia, and came to know some of the important thinkers of her era and corresponded with many of them regularly. She was part of a circle of friends that included authors Catherine Sedgwick, Washington Irving, the children of Alexander Hamilton and actor Fanny Kemble. When Rebecca was nineteen (1800), her father suffered a debilitating stroke, and she became his primary caretaker. Although she did not initially enjoy this role, she became the family nurse. She attended the births of many of her nieces and nephews and cared for sick relatives throughout her life. In the process she became involved in charitable works. As the founder of Philadelphia’s earliest women’s philanthropic organizations, Rebecca Gratz helped define a new identity for American women. She devoted her life to providing relief for Philadelphia’s underprivileged women and children, both Jews and Christians. A Jew living in a predominantly Christian culture, Gratz integrated her American experience and Jewish identity to establish the first American Jewish institutions run by women. 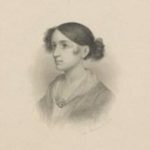 In 1801 Rebecca Gratz – along with her mother, sister and twenty-one other prominent women – founded Philadelphia’s first nonsectarian women’s charitable organization, The Female Association for the Relief of Women and Children in Reduced Circumstances. The Assocation’s mission was to aid honest, hardworking women whose families were suffering after the American Revolution. This first endeavor became the model for most of the organizations Gratz later established – women made all of the decisions and performed all of the work, including the management of funds. Gratz used her writing skills as the organization’s secretary and served in that position for twenty-two years. She recorded the minutes, handled correspondence, and wrote the annual reports and other documents for the Association. The secretary role enhanced Gratz’s authority and provided her a public forum from which to advance her own ideas about the ways in which organizations could promote both women’s roles and Judaism in Philadelphia and in America. The Jewish institutions with which she was involved especially reflected her own strong leadership. Through her work with the Female Association Gratz’s exposed her to the condition of poor widows and orphans in her community. 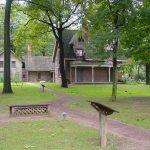 In 1815, she helped found the Philadelphia Orphan Society, which provided shelter and education to orphaned children until they were old enough to be apprenticed to families. Gratz served as the Asylum’s secretary for more than forty years. As secretary of the institutions she founded, she not only maintained organizational records, but addressed the managing boards on policy in her annual secretary’s report, which were published as pamphlets or in the press to raise public awareness and support for their work. Through her work, Gratz gained respect and admiration, and became an important figure in the community. In 1822, however, the Society suffered a terrible tragedy when twenty-three of the children in the facility were killed in a fire. Gratz helped raise funds to rebuild the asylum, and worked diligently to restore public faith in the institution and in the value of women’s charitable works. Gratz became well known, and consulted with other women who hoped to establish similar asylums. In response to the burgeoning Christian Sunday School movement, Gratz began a small religious school for her siblings and their children. Although this early experiment did not expand beyond her family members, it convinced Gratz that this kind of training was essential for Jews living in a Christian world. Bar Mitzvah preparation and private tutorials were the only avenues of formal Jewish education available for boys, and there were none at all for girls. The family school became the prototype for the Hebrew Sunday School that Gratz would establish twenty years later. While working with her charitable organizations, Gratz became concerned about the growing number of needy Jews in Philadelphia. In 1819, she helped establish the Female Hebrew Benevolent Society, which provided impoverished Jews with food, clothing, fuel and other necessities. At the same time she hoped to build women’s stature in the Jewish community and show that Jews could be self-sufficient. In 1820, Sir Walter Scott published the novel, Ivanhoe, whose heroine Rebecca was a beautiful young Jewish women who refused to marry out of her faith. Soon after the book was published, it was rumored that Rebecca Gratz was the model for Scott’s dashing medieval heroine, Rebecca of York. 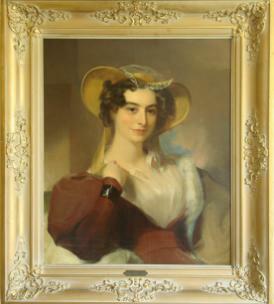 Irving spoke of his… cherished friend, Rebecca Gratz, of Philadelphia, described her wonderful beauty, related the story of her firm adherence to her religious faith under the most trying circumstances, and particularly illustrated her loveliness of character and zealous philanthropy. Scott was deeply interested and impressed, and conceived the plan of embodying the pure, moral sentiment that like a thread of silver ran through the story. Although Rob Roy was then unfinished, he was already revolving in his mind the plot and characters of Ivanhoe. He immediately determined to introduce a Jewish female character, and, on the strength of Irving’s vivid description, he named his heroine Rebecca. Like Scott’s Rebecca, Gratz was beautiful and talented and chose to remain single in a world that regarded marriage as a woman’s primary role. The Ivanhoe legend has given generations of Jewish-Americans a way to explain the accomplishments of a woman who defied traditional notions of achieving status in the Jewish community. I felt a little extra pleasure from Rebecca’s being a Hebrew maiden. It is worthy of Scott in a period when persecution has recommenced in Europe to hold up a picture of the superstition and cruelty in which it originated. An outspoken woman who apparently did not find an ‘agreeable domestic companion’ for herself, Gratz never married. She lived with her three bachelor brothers, Hyman, Joseph and Jacob throughout her life. Despite her skepticism about marriage, Gratz adored children. When her sister Rachel died during childbirth in 1823, Gratz resigned from the Female Association’s board, and took the six children into her home and raised them. In 1825, the children’s father, Solomon Moses, bought a house across the street from the Gratz family home and took the older children to live with him. Nevertheless Gratz continued to be a second mother to her nieces and nephews. Gratz was the first to apply the Sunday school format to Jewish education. 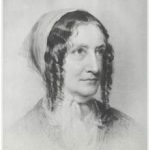 The women of the Female Hebrew Benevolent Society had always wanted to offer religious education to Jewish children, but were unable to do so until 1838, when Gratz established the Hebrew Sunday School (HSS) with herself as superintendent. She also served as secretary of the managing society until she was in her eighties. The HSS offered Jewish women their first public role in teaching religion. Only female graduates were invited to join the faculty, and the HSS’s teacher training program furthered the women’s religious education. Students ranged in age from early childhood to early teens. The model spread quickly and with Gratz’s assistance Jewish women in Charleston, Savannah and Baltimore established similar schools in their own communities. The School was radically different from traditional Jewish education programs; it was coeducational, met only once a week and lessons were taught in English instead of Hebrew. In addition, the school was run entirely by women and was the first Jewish institution to give women a public role in the education of Jewish children. Their efforts prompted the country’s leading Jewish educators to provide materials for their use. By the 1850’s, Gratz was seen as a visionary and indispensable community leader. She noticed that a growing number of poor Jewish children were being sent to live in Christian orphanages, which could undermine the children’s Jewish identity. In 1855, the Jewish Foster Home (JFH) opened, taking in children from all over the United States and Canada. It was the first Jewish orphanage in the United States. At the age of 74, Gratz became vice president of the Home’s managing society, and she continued to sit on the boards of the Female Hebrew Benevolent Society, the Philadelphia Orphan Asylum, and remained the superintendent of the Hebrew Sunday School for several more years. The JFH later merged with several other institutions to form Philadelphia’s Association for Jewish Children. Gratz’s fame intensified over the years. Although she outlived most of her friends and relatives, she continued to serve on the boards of her charities well into her eighties, ensuring that they would continue to flourish after her death. Many of the institutions she founded continued to provide food and shelter to thousands of women and children well into the 20th century. Rebecca Gratz died on August 27, 1869 at the age of 88, and was buried in Mikveh Israel’s historic cemetery in Philadelphia. By the end of her life, the legend claiming that Gratz was the prototype for the character of Rebecca in Sir Walter Scott’s novel Ivanhoe continued to flourish. It the first favorable depiction of a Jew in English fiction.